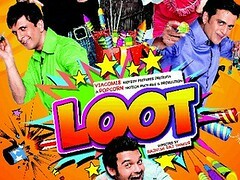 Loot is confused between being a regular, loud slapstick and being one of those several threads converge to make a "cool" pulp kind-of a film. Loot starts out the same old plot with four wannabe thugs setting out to loot something or the other. They are four but are almost alike when it comes to characteristics and quirks. They are loud, they crack wannabe jokes, they objectify women and sing and dance for no good reason. Their world is full of thugs and they encounter only their kind even when they go into a new world. And slowly Loot has a couple of twists and it becomes marginally interesting mainly because you weren't expecting a story to be thrown at you. I actually felt grateful even though the story is too convoluted to hold that interest for too long. But let's just better than nothing, it surely was. Loot also came across as a confused film because the acting and the dialogue were your run-of-the-mill slapstick, but the texture, the tone of the film is classier and the overall plot has a little more meat than usual. Loot is one of those films that you could stop by while flipping channels, ridicule the non-sense going on on-screen, get frustrated that you can't make sense of it and move on. Language: The F word used a couple of times.